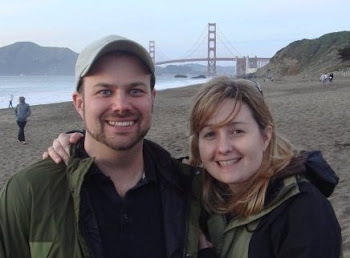 This October, Justin and I are celebrating our five year wedding anniversary. Since we're again living in the Bay Area, we decided to have our wedding cake remade by our cake baker, Nora Del Chamberlin of Custom Cakes. She is a wonderful cake baker and decorator in Berkeley, CA. She makes her cakes from scratch in her home and we not only loved the way her cakes looked but also how delicious they were. She surprisingly does not have a website but we highly recommend her. 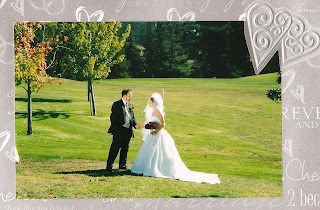 We were married in my home town in California at the church where I was baptized and grew up. We had such a lovely wedding with friends and family and it was truly a special day for us to share. Our wedding cake was a frangipane and butter cake filled with ganache, fresh raspberries and cream. 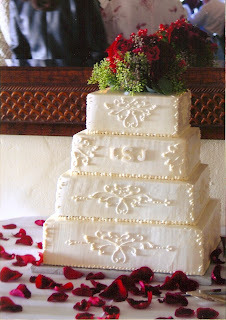 The frosting was buttercream and the design on the cake was inspired by the design of the beading on my dress. Our monogram was on the front of the cake as well. I had seen the idea for a monogram on a cake in Martha Stewart's magazines. I also liked the shape of the square-tiered cake. 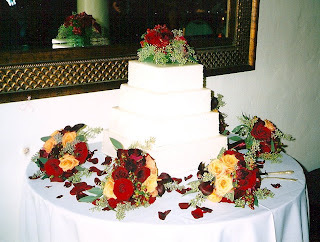 During the reception, the bridesmaids put their bouquets around the cake. It was a lovely and unexpected addition! 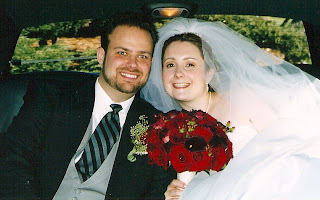 Justin and I were a proper bridal couple and there was no smooshing of cake! We also chose not to freeze our remaining tier of cake. 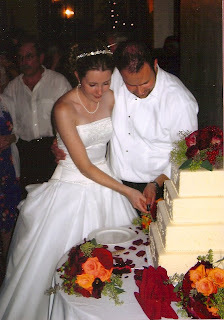 Instead, when we returned from our immediate honeymoon to Hawaii, we shared the cake with my parents and savored it. As food scientists, we didn't think that cake frozen for a year sounded very palatable. This is the beautiful recreation that Nora made for us. She asked for the exact date of our wedding and looked up the recipe in her files. She added a few decorative touches with the frosting and the flowers. The cake was just as good as we remember. The raspberries were fresh and full of flavor, the ganache was creamy and rich and even though we are not usually a huge almond fan, the almond flavor from the frangipane was delicate enough to make the cake interesting and delightful. It was a lovely way to remember our anniversary.